Below is a sub license or contract to manage the Security known public lands under specific terms and conditions to achieve specific goals. Although the entire text is important, Section 7 is the most relevant to the subject of this website. 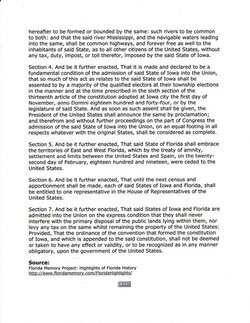 The Territory of Florida is admitted through benefit of the contract on the express condition… “that it shall never interfere with the primary disposal of the public lands lying within it”. In the document, there is only a single expressed condition to Florida's Statehood… the survival and perpetuation of the TRS Grid. It is considered that important to the creation of a State since the TRS Grid defines by federally recorded survey plats, identifies by monumentation placed in the ground, exactly where, and exactly what is “the public lands lying within them”. The entire State is Public Land as defined by The Land Ordinance of 1785. The Government of Florida and by extension its agents in Walton County, are obligated by law to maintain the TRS Grids. The conditionally sub licensed government of Florida begins in 1845. The Federal Government issues Patents directly to citizens, and entrusts the State of Florida with large portions of land to sell to raise State revenues. See Florida Archives for data ledgers on the States transactions involving United States Public Lands sales. It appears that the sub licensee did not produce or archive surveys of the US Public Lands entrusted to it or sold by it. It appears that there was no field verification of the location the size the shape or the quantity of the Public Land sold by the sub licensee. The sub licensee did no authentication or certification or confirmation of any kind that the US Public Land sold actually “fit” into the TRS Grid. There was no confirmation that the tracts issued did not fall short, or run long, or conflict with, distort, or interfere with the TRS Grid in anyway. It appears that the sub licensee relied primarily on the purchaser involved and the County Surveyors to get it right. The County Surveyors did not do their job according to the terms of Statehood and requirements of their office. By going the wrong direction, the County Surveyors established a new grid and their work was relied upon by the State, which had no type of oversight to insure the field work performed complied with the Federal guidelines. However… they did require and accept payment for the tracts of land sold. We assert that this is “interference” as defined by the Act of the 28th Congress of 1845, by and through error and omission and thus grossly negligent. This is a violation of the Public Trust and it’s fiduciary duty to each purchaser as well as to the Congress of the United States, and the Nation. This is a breach of the intent of Congress and of the “Contract” to which Walter and all others who purchased in “Good Faith” are direct parties to.